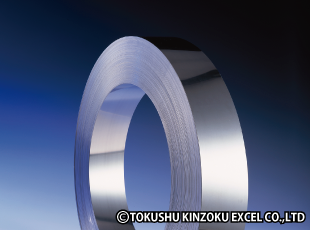 Nickel, Cobalt, and Titanium Alloys | TOKUSHU KINZOKU EXCEL CO.,LTD. Available ranges and shapes will change as per alloys types.Details described for Hastelloy-22, 276 ,Inconel 600 , 625 ,718 , X750 can be checked. To see details of alloys, click one of the buttons below, and then click the name of an alloy that you would like to learn more about. Click the name of a particular alloy to see a detailed specifications page. The table below contains details of typical components. To see details regarding other components of a particular alloy, see the relevant detailed specifications page. Excellent corrosion resistance to hydrochloric acid, sulfuric acid, and other corrosive reducing environments. Also has excellent thermal stability, formability, and stress corrosion cracking resistance. Corrosion resistance equivalent to C-276. Excellent high-temperature stability between 650°C–1040°C. Extremely good resistance to reducing and oxidizing corrosive environments. Used in applications where materials are subject to repeated reduction and oxidation. Resistant to wide range of corrosive environments and welded parts also have good corrosion resistance. Also used in applications requiring strength in high temperatures. Good resistance to reducing and oxidizing corrosive environments. Compared to C-276, has excellent corrosion resistance and stress corrosion cracking resistance under certain fixed conditions. Extremely good balance of high-temperature strength at 1200°C, oxidation-resistant properties, and formability. Excellent oxidation-, carburization-, and chlorine-resistant properties at temperatures up to 1260°C. Good balance of workability, heat cycle resistance, oxidation-resistant properties, thermal stability, and strength compared to other main heat-resistant alloys. Age-hardened alloy with excellent strength in temperatures up to 705°C. Also possesses oxidation-resistant properties, low thermal expansion properties, and high formability in temperatures up to 815°C, as well as excellent resistance in high-temperature fluoride environments. Age-hardened alloy with excellent formability in temperature range of 540°C–870°C, and excellent weldability. Super alloy that combines good weldability and workability with unrivalled heat-resistant properties. Excellent workability and strength. Used in wide temperature range of from ultralow temperatures up to 1095°C. Has particularly excellent oxidation-resistant properties and corrosion resistance under high temperatures. Provides excellent workability, corrosion resistance, weldability, and strength without the need for heat treatment. Used in wide temperature range from ultralow temperatures up to 982℃. Provides excellent workability when solution heat treated, and excellent strength, corrosion resistance, and weldability after heat treatment. Used in a wide range of temperatures from ultralow temperatures to 982℃. Precipitation hardening alloy with excellent corrosion resistance, oxidation-resistant properties, and high creep rupture strength. Stable structure even when kept at high temperature for long periods. Good strength and resistance to carburization. Also has good corrosion resistance in damp environments, and excellent workability. Excellent resistance to corrosion due to both reducing and oxidizing acids (particularly sulfuric and phosphoric acid), stress corrosion cracking, pitting corrosion, and crevice corrosion. Precipitation hardening alloy that demonstrates good corrosion resistance equivalent to I-825 in wide range of corrosive environments. Provides strength and good workability, and also has good corrosion resistance in wide range of environments including seawater, acid, and alkalies. This is one of Ni alloys that has been widely used for many years. Precipitation hardening alloy with corrosion resistance equivalent to M-400, and higher strength and hardness. Completely non-magnetic even at ultralow temperature of -100°C. Precipitation hardening Ni-Fe-Cr alloy. Modulus of elasticity can be kept constant between -45°C and 60°C depending on cold-rolling reduction rate and heat treatment conditions. Precipitation hardening alloy with high strength in the temperature range of 649°C–982°C. High-temperature strength, and excellent resistance to high-temperature corrosion and sulfuration at temperatures up to 982°C. *1 Registered trademark of Haynes International, Inc. Also available as an equivalent product. *2 Registered trademark of Special Metals Corporation. Also available as an equivalent product. High strength; good resistance to sulfides, high-temperature oxidation, and hydrogen embrittlement; and excellent corrosion resistance. Good strength, carburization resistance, and oxidation-resistant properties in high-temperature atmospheres. Often used in jet engine components and afterburner parts. Provides high strength, and better thermal stability and oxidation-resistant properties than HAYNES. Also has good sulfide resistance. *3 Registered trademark of United Technologies, Inc. Also available as an equivalent product. *4 Registered trademark of Standard Pressed Steel. Also available as an equivalent product. Pure titanium with a high degree of purity. Acquires elongation properties suitable for deep drawing via appropriate control of crystal granularity. Pure titanium grade used in applications requiring elongation and formability. Pure titanium with high strength. A titanium alloy with excellent weldability, workability, and corrosion resistance. A titanium alloy with corrosion resistance in chloride environments. Metastable beta titanium that can be cold worked and has high oxidation-resistant properties. Alpha and beta titanium with excellent weldability, workability, and corrosion resistance.